Providing you the best range of ceiling mounted lift & pull type cloth hangers type-1 and ceiling mount lift & pull hangers type-2 with effective & timely delivery. 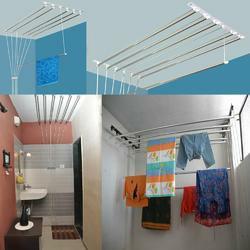 We are manufacturers of Ceiling Mounted Lift & Pull Type Cloth Hangers Type-1. 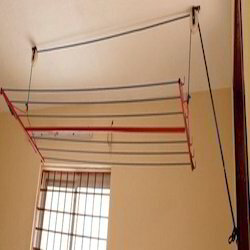 We also manufacture wall mounted foldable cloth hanger. Please contact us for your requirements. We also encourage dealership enquiries. The offered mounts are manufactured by using optimum quality raw material in accordance with set industry standards at our reliable vendors’ premises. We are manufacturers of Ceiling Mount Lift & Pull Hangers Type-2. The product is available in many colours and is very durable. The hangers are available is 6 feet and 8 feet sizes and is any tailour made sizes are required we will be able to produce the same for you. Packaging Details: The rate indicated is for 6 feet 6 lines individual drop down type for other variants please call us for the rates. Looking for Ceiling Mounted Lift and Pull Type Clot Hangers ?